Curious about going low-carb? This plain-English guide explains the latest research behind reduced-carbohydrate diets, dispelling the myths and revealing how to navigate your way through the good and bad carbs to create a diet plan that works! You get delicious recipes and lots of tips to make your low-carb diet a success. Katherine B. Chauncey, PhD, a registered dietician, is an Associate Professor and Director of Nutrition at the Texas Tech Medical Center's Center for Integrative and Nutritional Medicine. Part I: Understanding the Carbohydrate Controversy. Chapter 1: Mapping Out Low-Carb Dieting. Chapter 2: The Great Debate: Carbs versus Fat. Chapter 3: All Carbs Are Not Created Equal: Looking at the Differences. Chapter 4: Determining Whether Low-Carb Eating Is Right for You. Part II: Steering Yourself Back to Whole Foods. Chapter 5: Taking a Joyride: Falling in Love with Whole Foods. Chapter 6: Navigating Your Way through the Starchy Carbs. Chapter 7: Shifting into Dairy Foods. Chapter 8: Fueling Up with Fats: Good Fats, Bad Fats. Part III: Shopping, Cooking, and Dining Out. Chapter 9: Navigating the Supermarket. Chapter 10: Planning Menus and Meals. Chapter 11: Savory Beginnings and Sweet Endings: Choosing the Best Recipes. Chapter 12: Entrees and Side Dishes. Chapter 13: Eating Out without Apologies. Part IV: Recognizing Factors Other Than Food. Chapter 14: Taking Supplements When Food May Not Be Enough. Chapter 15: Setting a Fitness Goal. Part V: Sticking to the Plan. Chapter 16: Psyching Yourself Up. Chapter 17: Setting Yourself Up to Succeed. Chapter 18: Falling Off the Wagon and Getting On Again. Chapter 19: Ten Benefits of Low-Carb Dieting. 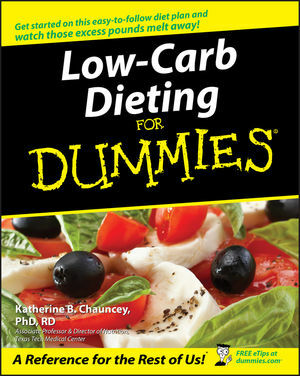 Chapter 20: Ten Frequently Asked Questions about Low-Carb Dieting. Chapter 21: Ten Sources of Help on the Web. Appendix A: The Body Mass Index. Appendix B: The Glycemic Index and Glycemic Load of Foods. Appendix C: Sample Grocery List. Appendix D: Dietary Reference Intakes. Appendix E: Metric Conversion Guide.